Thanks for the support, The Horse Lord has moved up to number 86 in top 100 over the weekend, let’s see if we can get it up further! Make sure to follow this blog and pass it to your friends; if you enjoyed the Horse Lord then you might be interested to hear that new material will be coming soon, there will be an update next weekend on what that will be so do watch out for it. The Horse Lord is now available on any apple device, iphone to ipad. Download the kindle app for free and pick up The Horse Lord to read anytime; on the daily commute; to a quiet moment in a rugby match, waiting for the ball; or crossing the antarctic with a pack of sixteen huskies – whenever the book bug itches – The Horse Lord is there for you. Thanks to everyone leaving their reviews on Amazon, and everywhere else, about The Horse Lord. I hope you all are enjoying it. 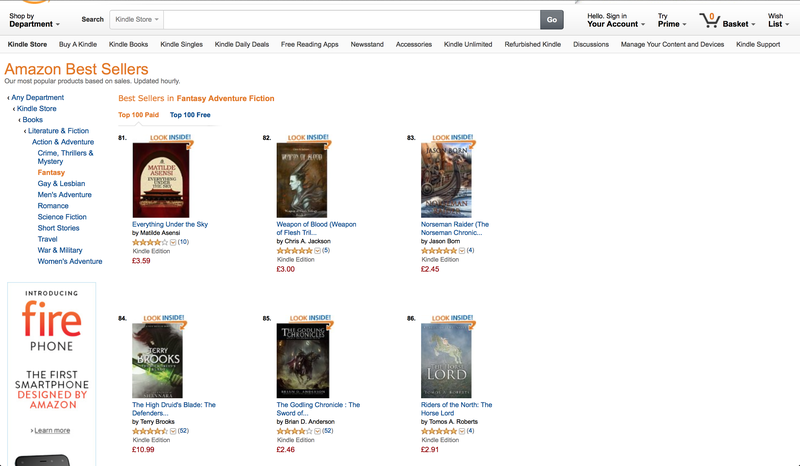 The launch has gone well and it is climbing up towards the top hundred books on Amazon, so thank you all. If you liked the Horse Lord please spread the word to all your friends and family. Tales of the North The Riders of the North is a series of books following multiple characters from the horse faring race of warriors to the north, to the soft, and civilised people of the capital city in the south, and everything inbetween. The north riders’ culture is one of meritocracy and equality, even their hierarchy of Lords is based on this and not birth right. This has produced noble, fierce and deadly warriors. When the peace of the Empire comes under threat from an enemy within, a hodge-podge group of northern warriors and southerners are thrown together. The Horse Lord is the one of the short stories that aligns with the main story, Riders of the North: The Games. In the Horse Lord we follow Teo as he sets about becoming his own man and creating the Lion’s Pride, a new banner for his countrymen to follow, but will any rise to join him?